If you’ve never considered salmon aquaponics then it’s time you did! Getting started with an aquaponics system is relatively straightforward, you need a tank for the fish, grow beds for your plants, a pump and bell siphon or U siphon to control the water flow, as well as the right gear to test the water. Getting the pH, ammonia levels, dissolved oxygen, and even the temperature right is essential for your fish to flourish. That’s why so many beginners started with the traditional aquaponics fish; tilapia. But, it’s not as difficult as you think to start raising salmon in aquaponics. Providing you like salmon, you’ll be saving yourself a fortune on purchasing one of the healthiest fish you can get for your table. That’s a great incentive! As an added bonus, most of the salmon you’ll find in the shops is produced on farms; at least if you’re producing your own you’ll know exactly what chemicals it’s been exposed to: none. Add your homegrown vegetables using your aquaponics set up and you’ve got a virtually free dinner. It’s important to know the right temperature and the growth rate of aquaponics salmon. These are discussed below, but, you’ll find the following tips useful when starting your system. Salmon is actually the family name for a number of species of ray-finned fish, including trout, arctic char, grayling, and even whitefish. Remember this when shopping for your salmon. Salmon are born in fresh water but migrate to the sea. 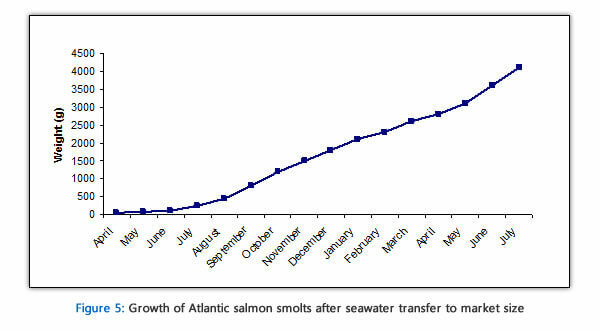 However, they return to freshwater to breed, in fact, most salmon actually return to the spot where they were born. 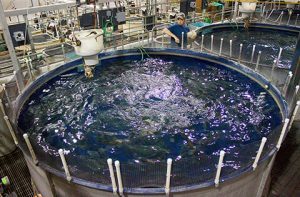 This can cause complications if you’re hoping to breed salmon in your salmon aquaponics system be aware that this generally difficult. Salmon is a very social fish. However, if you try to keep too many of them in close proximity you will increase the risk of disease. Don’t try to overstock your tank, always considered the size the fish will grow to as opposed to the size they are now. This is actually true of any fish in an aquaponics system. Salmon lay thousands of eggs in a hole in the river bed. These will hatch between 6 and 20 weeks after fertilization. The exact amount of tie will vary according to water temperature, oxygen levels, and even the carbon dioxide level. Once hatched the tiny alevins (baby salmon), will live under rocks as they feed on the attached yolk sac. Once this has been used up the fingerlings will emerge from the rocks. Generally pink and chum salmon will head straight for the sea, other types will stay in the river for up to 2 years and then head to the sea. 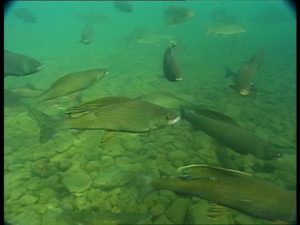 At 2 years the salmon are fully grown; they will continue to live in the sea water until they are ready to make the trip back up the river. In your aquaponics system, this means it can take 2 years for a salmon to reach full size; which is likely to be approximately 20 inches. In the wild, they can get as big as 5 feet! Salmon are cold water fish. They enjoy fresh, cold water, you’re going to need to keep the water moving in your tank and to keep them at between 55°F and 65°F. If you live in a warm area this can be challenging. There is no doubt that salmon is both delicious and healthy. It may take some time before you can reap the rewards of your efforts but it will be worth it. Salmon are well adapted to the cold, allowing you to set the system up and practically forget about them; providing you live in the right climate and remember to feed them. Out of all the fish, you could try, salmon aquaponics is one of the most difficult. It’s not so much the temperature as the fact they need to have a constant supply of cold, fresh water. Of course, this can cause an issue with the closed circuit operation that aquaponics is designed to be. It is possible to overcome this but this is not a project for the faint-hearted. The meat of an aquaponic salmon is less pink than a wild or even commercially farmed one. The fish also tend to be a third of the size of wild ones. This means you’re getting less bang for your buck; although whether this is really a disadvantage is debatable. Even if you don’t overstock your tank, salmon are known to be disease prone. This disease can quickly spread through a tank or even into the food chain. For this reason, you may struggle to get permission for a salmon aquaponics system. In the wild young salmon eat insects and plankton. Once fully grown they will eat most fish that are smaller than them, eels, shrimp, and even squid. In your tank, you’ll need to provide them with a similar diet. Some may adapt to pellets but not all salmon do. It will be a case of trial and error. How old do salmon get? 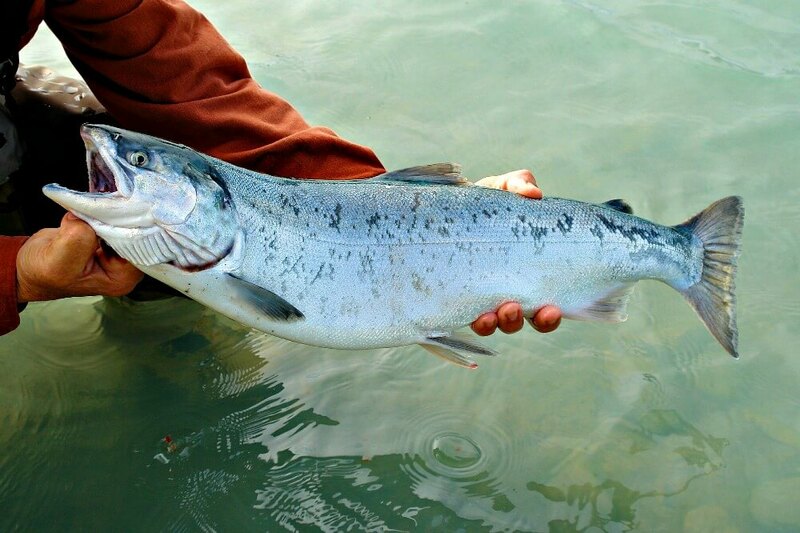 Salmon won’t spawn until they are at least 2 years old and some will wait until they’re 7 years old! The average lifespan of a salmon is 8 years. Delicious! Salmon tends to have a slightly buttery taste, but it is high in healthy fats. You’ll usually find it tastes better when grown in your own aquaponics system than when purchased from a store, (and commercially farmed). You can eat it as sushi, providing you prepare it properly first, or you can try one of the hundreds of recipes on the internet; depending on your preference. Can they be kept with other fish? Because salmon are part of the same family as several other fish, it is possible to keep similar sized fish together. Trout and char are both comfortable living with salmon. However, you have to consider the additional difficulties you will face in maintaining your salmon aquaponics system when you have more than one type of fish in it.